PCGS Restoration is a service designed to help Collectors address environmental problems with their coins. Through various non-invasive and industry-accepted techniques, PCGS Restoration can safely restore and enhance the appearance of coins. Coins are evaluated to confirm restorative services can be performed. Coins that pass the initial evaluation will be restored and graded. Coins are covered by the PCGS Guarantee of Grade and Authenticity. To Restore Your Coins, Download the PDF Submission Form. Modern Service (1965 to Date, Maximum value $1,000 per coin): $22 per coin Restoration and Grading fee. General Submissions: Restoration and Grading Fee is 2% of the value of the coin in its final grade (min. of $30). PCGS will determine all fees once the order is finalized. $10 Evaluation Fee – If PCGS determines the coin(s) will not benefit from restoration, nor should be restored, the coin(s) can still be submitted for grading. Coins that are not graded will be charged a fee of $10 per coin. For coins that complete the grading process, standard grading fees apply plus the evaluation fee (see submission form cover sheet for grading fee structure). Guarantee Premium Fee – All non-restorable coins submitted for grading, valued above $100,000 per coin, will be charged a 1% Guarantee Premium Fee. The 1% fee is based upon the value of the coin in its final grade. PCGS reserves the right to make the final determination of the coin’s value. Final cost of the submission cannot be determined until coins have completed the restoration and grading process; consequently, the submission form costs will be estimated using the declared value for each coin. Only credit cards or established lines of credit will be acceptable forms of payment. Shipping Fees are based upon the number of coins and the declared value. See reverse of submission form for shipping rates. All U.S. and World coins that PCGS currently authenticates may be submitted. You must be a current PCGS Collectors Club Member or PCGS Authorized Dealer to submit coins for PCGS Restoration. The appropriate PCGS Restoration submission form must be used. Submit current PCGS-graded coins in their existing holders. We do not accept minimum grade requests. Coins graded by other third-party grading services may be submitted, only if you authorize PCGS to remove the coin(s) from their holder following the initial evaluation of the coin(s). Coins removed from other third-party holders do not qualify for a grade guarantee. You indemnify PCGS from any damage that may be done to the coin(s) during this process. You also acknowledge that some coins may have problems that are not apparent until removed from their holder. Restoration submissions will be accepted through the mail or at shows. All restoration services are performed at the PCGS office. Genuine with Details is the default Genuine service. 'Genuine only' or 'Do Not Holder' options can be selected on the submission form. Estimated turnaround time is 4-6 weeks. All coins are evaluated before being removed from their holders. You must agree that PCGS has the right to determine all final coin values. You must agree to pay all fees as determined by PCGS or your submission will not be accepted. All grades are possible including Genuine, Not Gradable. Submitting a coin for PCGS Restoration in no way guarantees the upgrade of your coin. If the coin is already in a PCGS holder, it is guaranteed not to downgrade, nothing more. Through our restoration service, PCGS is committed to preserving and restoring coins to their original and natural condition. 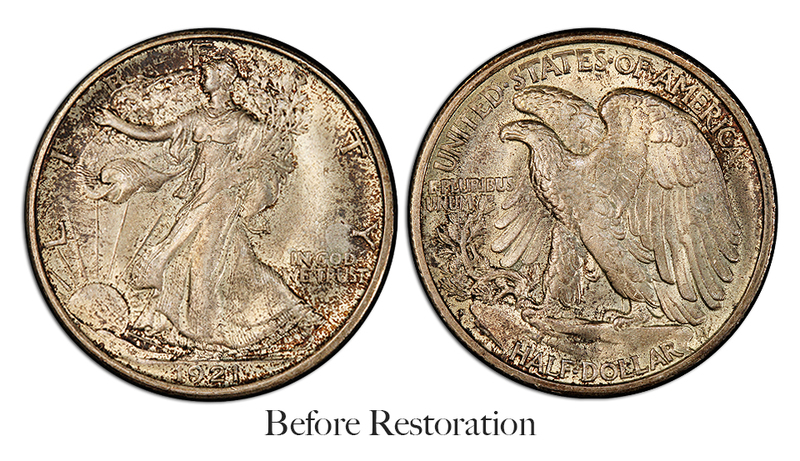 PCGS Restoration will not remove original toning simply to make a coin white. PCGS Restoration will never add toning to a coin. In cases where PCGS determines that removing toning is necessary and desirable and will not detract from the coin, it may be done. This type of toning may be the result of improper storage, interaction with corrosive materials, or a stain due to an accidental spill. 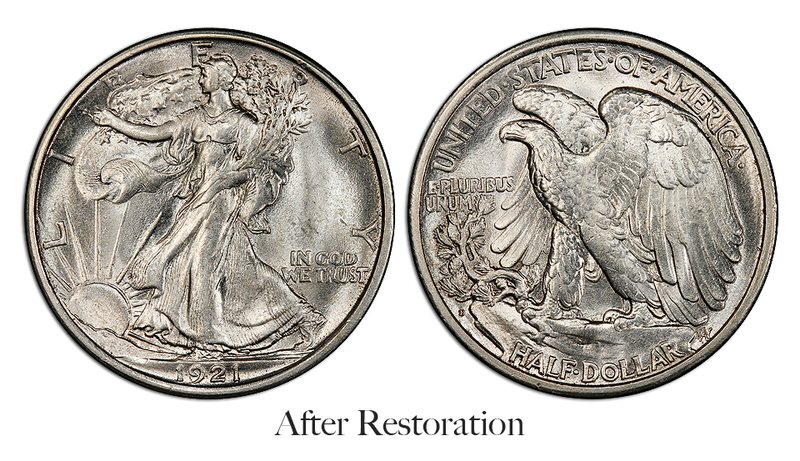 Restoration will remove contaminants introduced to the coin's surface through improper care or storage. Examples include PVC or Verdigris. Dirt or debris can often be removed through a gentle rinse. PCGS Restoration will never add any substance to the surface of a coin. Spots on coins can be the result of a variety of causes. Many spots can be removed, yet some cannot be removed without damaging the coin. PCGS will not attempt to remove a spot unless it is determined that the spot significantly detracts from the coin's overall appearance or is active and will continue to grow. PCGS will not attempt to restore a spotted coin if that in our opinion, a spot is so deep that removal would lower the coin's overall condition. Older spots such as old spittle or old thumbprints often cannot be removed without stripping the coin's original surface and will not be attempted. Newer contaminants such as recent fingerprints can be removed. Also, certain spots due to corrosive interactions can often be removed without impairing the surface. PCGS Restoration will never add, remove or alter metal. This includes engaging in well-known “coin doctoring” practices such as smoothing, whizzing, polishing, engraving, etc. Issues such as scratches, dings, planchet flaws or bending will not be addressed. If it is determined that a coin suffering from one or more of these problems does not have other issues that can be addressed through Restoration, the coin will be returned as is.